Sri City, November 4, 2016:- Mr. Yasar Shah, Cabinet Minister for Commercial Taxes, Govt. 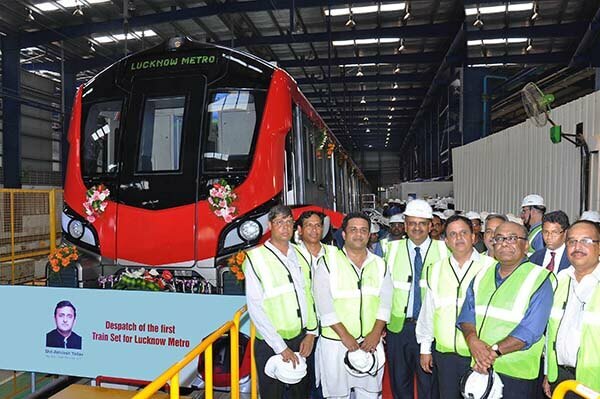 of UP formally received the keys of the first set of Metro rolling stock for Lucknow Metro project on Friday in a grand function held at the Alstom factory premises in Sri City. Alstom has been entrusted with job of supplying metro train-sets and a signalling solution for the new metro network of the city of Lucknow. Mr. Yasar Shah inspected and gave formal clearance for the despatch of the coaches in the august presence of Mr. Alok Ranjan, Chief Advisor to Hon’ble Chief Minister of UP, Mr. Rahul Bhatnagar, Chief Secretary, Govt. of UP, Mr. Kumar Keshav, Managing Director, Lucknow Metro Rail Corporation (LMRC), Mr. Alexandre Domingues, Vice President, (Operations), Asia Pacific, Alstom, Mr. Bharat Salhotra, Managing a Director, Alstom Transport India, Mr. Ravindra Sannareddy, Founder Managing Director, Sri City, a team of senior officials of UP governmrnt and LMRC, and several other dignitaries. formally handed over the keys. Addressing the gathering Mr. Yasar Shah appreciated the works of Alstom and thanked the whole team of Alstom and LMRC for giving metro train service to Lucknow city. Mr. Ravindra Sannareddy extended a warm welcome to the Hon’ble cabinet minister and the senior bureaucrats of UP government and the officials of LMRC.